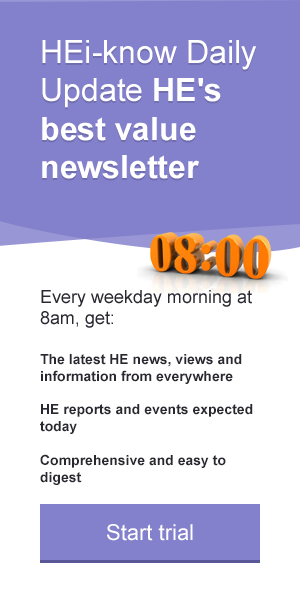 Start a free trial of our HE intelligence service HEi-know this month to qualify for 2 months extra free. Special offer for Going Global delegates! Latest figures suggest that the number of Chinese students coming to study in the UK may be beginning to flatten, or at least that growth might be less strong going forward. HEi-know examines the implications of the trend, and how the sector is responding. There are nearly 90,000 students from mainland China at UK universities and they account for about one fifth of all international students in the UK. Until recently it has appeared that growth in the UK’s intake of Chinese students would continue unabated. Yet worries that the Chinese bubble could be about to burst persist, not least because the UK HE sector has become so reliant on this market. In a recent report, Matt Durnin, the British Council’s Head of Research and Consultancy, East Asia, described recruitment from China as “the linchpin of UK student recruitment”, adding that “the unrelenting rise in China’s outbound students has kept the UK international sector afloat through tightened visa restrictions and a financial crisis”. But there are troubling signs that this might have “finally found its ceiling”, he warned. Growth in the number of all outbound students from China slowed “sharply” in 2016, and study visa growth slid to 8 per cent year on year, down from a 10 per cent expansion the previous year. This may seem a small shift, but with China accounting for two thirds of absolute growth in the UK’s international intakes, any tail-off in numbers could “tip much more heavily towards an overall decline in UK recruitment”. The potential impact of overseas recruitment falling short of expectations was recently highlighted by the Higher Education Funding Council for England in its annual report on the financial health of the sector (see HEi-know Briefing Report 340). The report warned that the sector’s forecast that overseas income would rise to £4.8 billion by 2018-19 might “be difficult to achieve” due to increased competition from other countries and proposed changes to student immigration rules. The funding body said data suggested there was an “overconfidence by the sector in student number forecasts”. For now at least, the UK’s attraction for Chinese students remains strong, according to Rachael Merola, Senior Researcher at The Observatory on Borderless Higher Education (OBHE). She said: “The UK is an attractive destination for Chinese students in part due to its prestigious universities, however Chinese student numbers are on the rise in other countries, as well. Raegan Hiles, Head of Outbound Mobilities Programmes for Universities UK International, is equally optimistic, while acknowledging that growth in Chinese student international mobility has slowed. There is also confidence that recruitment levels can be maintained through growth in transnational education (TNE) agreements. Rachel Merola of the OBHE says UK institutions “have become increasingly active in transnational education partnerships with China”, and are “deepening and strengthening their links” there. International Branch Campuses (IBCs) have been a “particularly active form of TNE between the UK and China”, with the number of UK branch campuses in China reaching nine this year. At the same time, China will open its first IBC in the UK in 2018 - Peking University’s HSBC Business School. Some recently announced partnerships between UK and Chinese institutions further demonstrate how the market is evolving. Leicester University is to open its first foreign campus in China in September in partnership with Dalian University of Technology. At what will be the Dalian University of Technology-Leicester International Institute, more than 1,200 students will eventually be studying for Leicester degrees in Maths, Chemistry and Mechanical Engineering. It is also expected that up to 10 per cent of UK students from Leicester will be taught on the campus, and both Chinese and UK students will be able to gain dual degrees awarded by Leicester and Dalian. Sheffield University, which is home to almost 3,000 Chinese students, recently signed an agreement with Shanghai Jiao Tong University for two-way student exchanges across all disciplines. Students visiting from Sheffield will study their chosen academic subject as well as the Chinese language. The Leicester and Sheffield partnerships represents developments from the trailblazing model between Liverpool University and China’s Xi’an Jiaotong University, which led to the creation of Xi’an Jiaotong-Liverpool University 11 years ago. Students from Liverpool study at the joint institution as part of Liverpool’s “Year in China” programme, taking a course in Chinese as well as a module related to their core degree. According a report from the CBI, joint or double degree programmes with Chinese partner institutions are an increasingly popular and effective form of TNE. There are about 950 such programmes in China, involving 650 Chinese universities and colleges and partners from a total of 33 countries. The CBI says Business Studies and Management courses dominate, but there is great scope for growth in engineering and the social sciences and in parts of the country where there has been less international engagement so far. Its report cites as examples the University of Exeter’s double degree programme with Fudan University, Harper Adams University’s partnerships with two Chinese universities, and other partnerships involving Nottingham Trent University and Queen’s University Belfast. Raegan Hiles agrees that opportunities for growth in TNE in China appear strong. 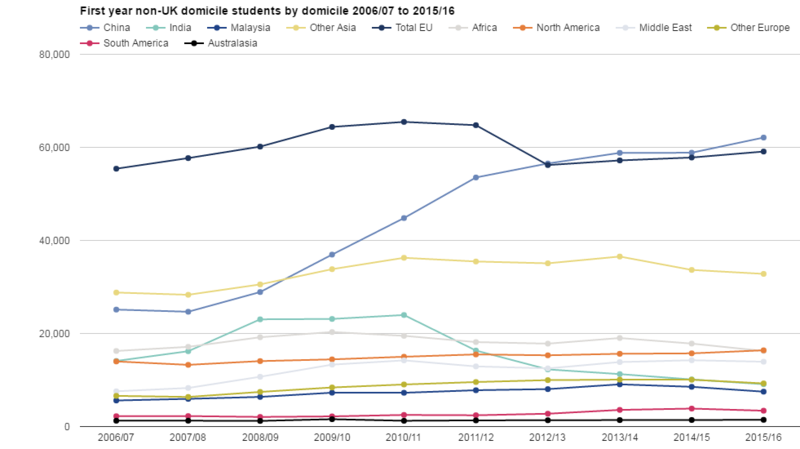 She added that TNE is also “an increasingly important route through to studying in the UK for international students” and that “dips at the first year entry recruitment level are in many cases being met with growth at later entry levels”. Dampening the appetite for Chinese ventures to some extents are concerns about state controls on HE and the operating environment. In December, Premier Xi Jinping’s told party officials and university leaders to “build colleges into strongholds that adhere to Party leadership”. A recent report for Universities UK said more state controls on universities were expected, in the form of “enhanced oversight and reporting requirements”. The Financial Times reported on 25 April that the Communist authorities had sent inspectors to 29 of China’s leading universities in March – including many with joint programmes with overseas institutions as part of an anti-corruption campaign. It said the inspectors were looking for examples of “breaches of political discipline…including the infiltration of western values such as democracy and free speech”. According to the FT, although many institutions are keen to work with China “the desire to attract Chinese students and operate inside China has often clashed with the traditional commitment to academic freedom in the West”. UUK’s report said it was unclear what impact the political rhetoric would have on UK university engagement with China, saying this sat alongside an “interest in continued international cooperation”. A lack of clear guidelines had led to frustration and ambiguity and created a “potentially precarious operating environment”, it said. Despite its apparent mistrust of the West, recent legislation shows that the Chinese government is still keen to court partnerships with overseas institutions, and also to encourage more international students to study in China. It is making legal changes to allow foreign students to gain work experience, internships, and jobs. Clearly, Chinese higher education remains very much open for business and its growing importance will be impossible for the UK to ignore. The UK government, particularly in the light of Brexit, is keen to increase trade and cultural links with China, which recently hosted the G20 summit of leading industrial nations for the first time. Its influence in HE is also growing as its universities move up the international league tables: three are now in the top 50 QS rankings. Under these circumstances, deeper links and further evolution in partnerships between UK and Chinese HE seem inevitable.